@ home supplements to curriculum...have fun and explore! This page is best viewed using a computer. Sorry it's not an iPad friendly page. FAVORITE WEBSITE to EXPLORE, click here. This is my favorite website for oodles to entertain and learn by grade level and subject. This site was created for Oak Grove Elementary School in North Carolina. Lots of fun and challenges for Kinders through 2nd graders at this BBC site Bitesize. Try the Animal Island Data. Check out BrainPop for some great movies on computers and internet research. Learn the parts of a computer by reading this fun 3d pop-up book from ZooBurst about the 3 Little Pigs in the computer lab. Or watch the BrainPop Jr. video on parts of a computer. A little practice goes a long way to enjoying all the learning opportunities using a computer offers. Click here for our Computer Lab home page that has Dance Mat Typing and along with other keyboarding favorites. Our district goal for 4th graders is 12 words per minute. Practice 20 minutes at a time to improve your muscle memory. Good luck and happy typing! Type the letters of the alphabet. Click here to practice. Type some sentences. Click here to practice. 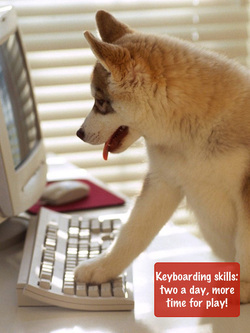 Learn to type a few keys at a time. You can also try a 1 minute speed test when you think you're ready. Try test #11 - all the keys including punctuation. Click here to start the lessons. Try typing your name, with a capital letter in your first and last name, without looking at the keyboard. The internet is like the wild, wild west. Before venturing westward, learn to surf safely, that way you'll have more fun exploring. Try this adventure at Surf Swell Island for starters. Bring your Surf Swell Island Certificate of Swellness to the computer lab for a gold card. Something for everyone....Looking for more cyber safety links? Start here at Cyber Smart, they'll keep you in the know. Take a look at the "Home Connection" downloadable files. 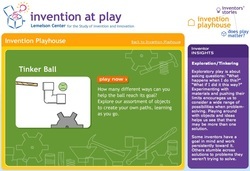 Do you like inventing? How about tinkering? Here's a fun website for all ages to give it a try. If you want to use your iPad, I recommend an app called TinkerBox. The only drawback is you do have to pay for TinkerBox. 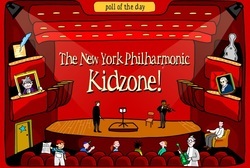 Challenge yourself and make some awesome music at the New York Philharmonic website for kids. In just a few minutes, I created this Musical Mingles masterpiece in the Game Room. OK, it's not a masterpiece but it has potential. With an adults help, maybe you can send me your music masterpiece. A gold card awaits you. Want to make a Movie? Try the Zimmer Twins. The Zimmer Twins is a cool site, no login needed just to explore. If you want to save your projects to work on later, you do need help creating an account. Want to save the forest? Learn how and what it takes in this challenging adventure at Forestia.